Gather recent tweets with keyword searches. The tweets will be a maximum of 7-10 days old. Keep Mozdeh switched on to gather a large collection of tweets for weeks, months or years. This allows up to 180 queries (i.e., pages of up to 100 results) per 15 minute window - or up to 72,000 tweets per hour. Read a discussion of the comprehensiveness of this method. To retrieve older tweets with keyword searches, you have to pay Twitter. It gets the full tweets or the first 140 characters of unmodified retweets. Gather tweets from one or more users, up to a maximum of the most recent 3,200 tweets per user. This collects at a rate of 180 queries (i.e., pages of up to 100 results) per 15 minute window - or up to 72,000 tweets per hour. It gets the full tweets or the first 140 characters of unmodified retweets. Gather comments on YouTube videos - about a million per day. Watch video about downloading videos. Gather comments from subreddits on Reddit. Import academic citations, TripAdvisor reviews, Reddit comments, or other formatted or unformatted texts: see the Import Data button in the Startup Wizard. Facebook importing is no longer possible. 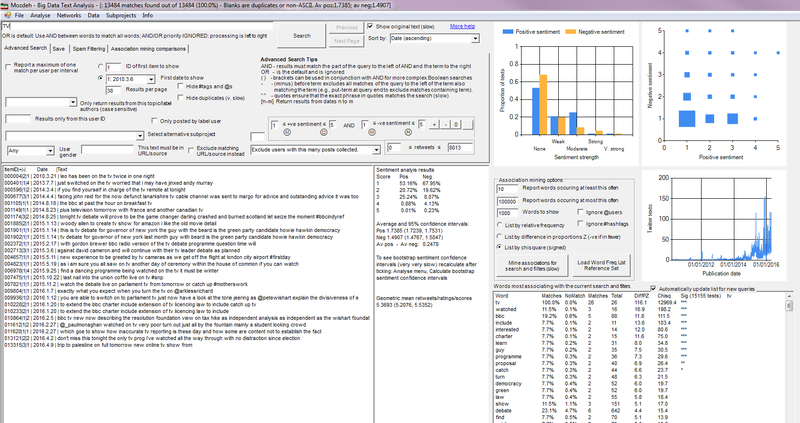 Search the texts gathered with keyword queries and/or sentiment strength and/or author gender. 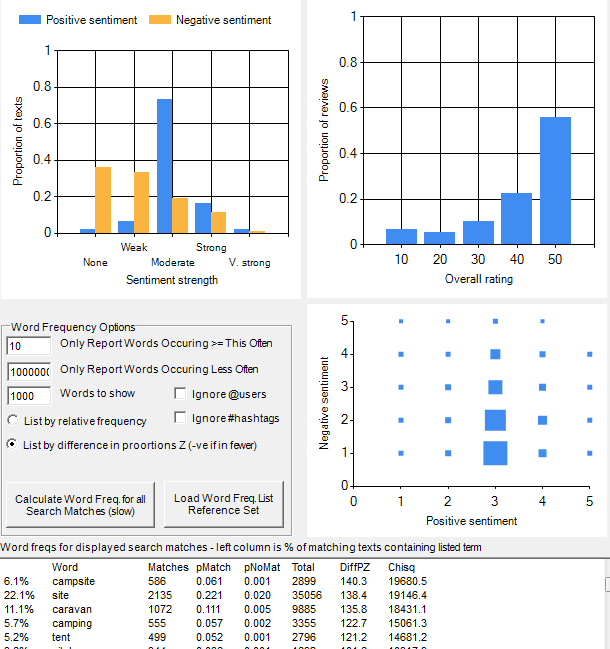 Search by sentiment, measure the average sentiment for a query, or find terms associating with positive or negative sentiment. Draw time series graphs of the volume of posts in your topic or the percentage of texts matching any query in your topic. See also examples of time series analyses. Draw a time series graph of the average positive and negative sentiment strength of texts overall or for texts matching a query in your topic (see the bottom of the main time series graphs page). Find gender differences in the texts. Find the average retweet/citation/like count for texts matching a query/gender/sentiment (includes confidence intervals). Create networks of users from their texts. Create time series graphs for an individual user in your collection (thanks to Kim Holmberg for these instructions). Find words with a sudden frequency increase (i.e., keyword spike detection) in the data. Save a random sample of texts for a content analysis. If you already have a sample and need to randomise it you could use Excel. Mozdeh was used to collect and analyse data for the following publications. Thelwall, M. (2018). Can museums find male or female audiences online with YouTube? Aslib Journal of Information Management, 70(5), 481-497. Thelwall, M. & Mas-Bleda, A. (2018). YouTube science channel video presenters and comments: Female friendly or vestiges of sexism? Aslib Journal of Information Management, 70(1), 28-46. Thelwall, M. (2018). Can social news websites pay for content and curation? The SteemIt cryptocurrency model. Journal of Information Science, 44(6), 736–751. Ahmed, W. (2018). Using Social Media Data for Research: An Overview of Tools. Journal of Communication Technology, 1(1), 77-94. Holmberg, K., & Hellsten, I. (2014, June). Analyzing the climate change debate on Twitter: content and differences between genders. In Proceedings of the 2014 ACM conference on Web science (pp. 287-288). ACM. Terlumun, I. T., Appollm, Y. I., Ibrahim, F. J., Mamman, F. S., Yusuf, A. K., & Ibrahim, A. H. (2018). Determining the Effectiveness of Youtube Videos in Teaching and Learning with Mozdeh Algorithm. International Journal of Education and Evaluation. Thelwall, M., & Cugelman, B. (2017). Monitoring Twitter strategies to discover resonating topics: The case of the UNDP. El profesional de la información. Thelwall, M. (2008). No place for news in social network web sites?. Online Information Review, 32(6), 726-744. 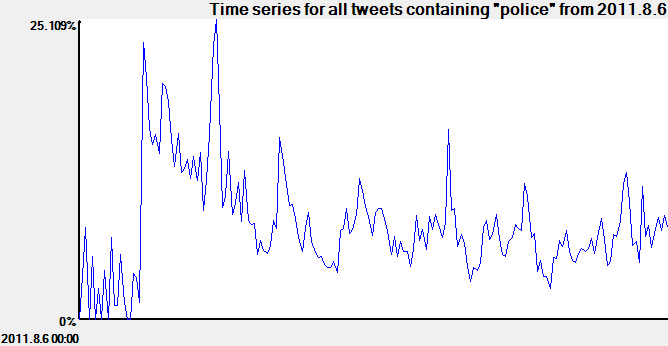 Theoretical overview and introduction to time series and sentiment analysis for Twitter chapter. June 2017 one day quick course - slides and workshop. The YouTube Comment Term Frequency Comparison (CTFC) method. Sentiment and retweet/reviews/citation graphs and the top of the word frequency table. Mozdeh can produce a time series graph of the volume of texts for your topic. 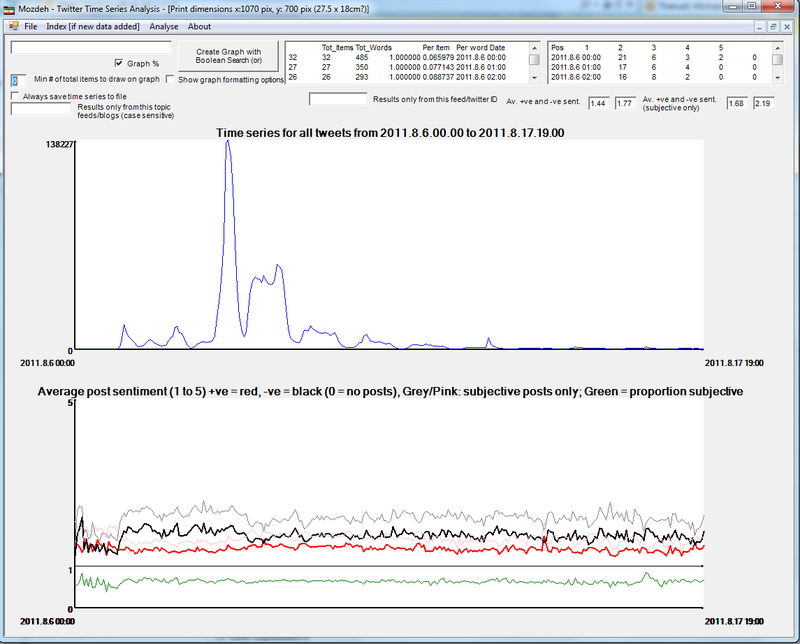 The graph below is a section of a screenshot showing the hourly volume of tweeting for a corpus of tweets related to the 2011 UK Riots in 2011. Mozdeh can produce a time series graph of the percentage of texts matching a query for your topic. The graph below is a section of a screenshot showing the hourly percentage of tweets mentioning police in a UK Riots 2011 corpus. Mozdeh can produce a time series graph of the average positive and negative sentiment of texts for your whole topic or just the texts matching a query for your topic. 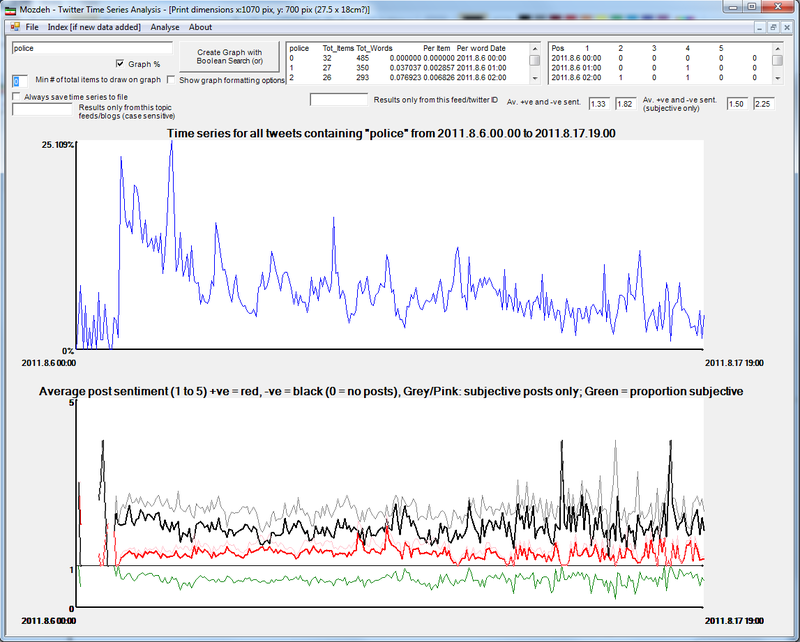 The graph below is a section of a screenshot showing the hourly average sentiment of tweets mentioning police in a UK Riots 2011 corpus. Mozdeh can search for texts matching a query for your topic. 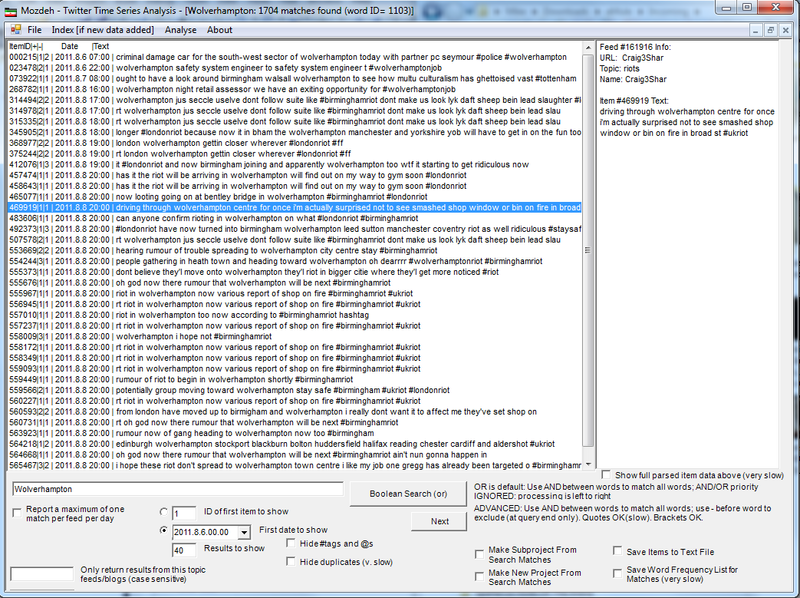 The picture below is a section of a screenshot showing some of the results of a search for Wolverhampton in a UK Riots 2011 Twitter corpus. If you can't use Windows, then you might try COSMOS for Mac/Linux or investigate this list of social media software.